When, in December 2012, Adam Lanza rampaged Sandy Hook Elementary, killing 20 children and 6 adult staff members, people blamed the mother for not taking proper care of her child. But how was she supposed to care for her mentally ill son when the mental health system is so broken, argues Liza Long. Ms Long is also the mother of an unstable, mentally ill child who has violent outbursts. She can relate to Adam Lanza’s mother’s quandary. 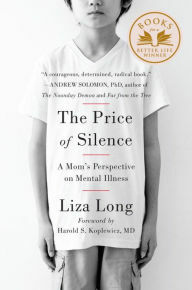 In The Price of Silence, Ms. Long outlines the problems with the mental healthcare system, focusing primarily on how it fails our children. It’s nearly impossible to find a school that will educate children prone to outbursts, and impossible to afford mental health care as a home-schooler. Parents often have to divorce and quit their jobs in order to apply for state assistance. Even when they have state assistance, there are very few safe residential facilities for minors who need more focused care. Thus, the children end up bursting into rages that get them arrested. Most minors in juvenile detention are mentally ill, in fact. Such minors cycle in and out of juvenile detention, where they get only minimal education or treatment for their mental disorders. The price we pay for housing these minors in juvenile detention is much higher than we would pay to house them in residential facilities, and is much less effective, argues Ms. Long. This was a very interesting book which will unfortunately only be read by people who already appreciate how broken our mental health system is. It provides a lot of information, while staying personal because of Ms. Long’s biographical sections. It’s a very readable book. That said, I think she overstated her case a bit. This overstatement is probably partly due to her passion for the subject, and also because she lives in Idaho, a state which is less likely to provide social programs to care for the disabled. Despite the overstatments, however, I think this book is well-worth reading. It was a good supplement to The Fifth Child, which I read in October, and I plan on supplementing it further with We Need to Talk about Kevin soon. This sounds like a very important book. It is such a shame that in our society, with all its resources, that we have a system that makes it impossible to access help for so many. Wow – this is sad. And scary. We Need to Talk About Kevin is on my TBR list…I hope I can get to it…you know how that goes. What an important subject! I worked in mental health for years, and I have seen numbers of lost and desperate families. I am adding this book to my TBR. Thank you for the introduction! I know exactly how that goes. I'm hoping the same thing and it's on my top 12! You're welcome! Hopefully you enjoy it! This sounds depressing, but worthwhile. I've gotten the impression that our mental health care support system isn't so good from some tangential reading I've done, but I think I'd learn a lot from this.